As part of our on-going “Disney Chef Spotlight” series, we’ll introduce you to a Disney chef at Walt Disney World Resort in Florida, Disneyland Resort in California, or Aulani, a Disney Resort & Spa in Hawaii. Whether they work in our convention resorts or Theme Parks, these talented culinarians create memorable dining experiences for private catered events every single day. Hi, Chef Peter. Tell us about a typical day in your role. There are no typical days in catering. Every day is unique depending on the type of group we are servicing and their particular needs. Early on in the event planning stages, we work in conjunction with our Event Services Team to tailor menus to specific client needs for menu content and budget. How long have you been with Disney, and what was your first role with the Company? I started at Disney in 2015 as Catering Chef de Cuisine at Disney’s Grand Floridian Resort & Spa. I have been on the Coronado Springs Resort catering team for just over a year. Tell us about your first memory of cooking? What did you make and how did it turn out? My first memory of cooking in a professional kitchen, which was long before I knew it would become a career, was in high school while working in a kosher restaurant as a dishwasher, and I was asked/told to help make matzo balls. They came out terrible, and the Chef discarded them, and then showed me how to make them correctly. Lesson learned, if it is not right, don’t serve it. What is your most favorite part of your job, and why? I enjoy the day-to-day energy of a busy kitchen, as well as the military-type chain of command. Each Cast Member and leader keeps a piece of the puzzle headed in the right direction until the puzzle is complete. The end result is our convention clients are happy, as we work to exceed their expectations. Convention attendees can also look forward to the new renovations coming to Disney's Coronado Springs Resort, which will enhance the overall meeting experience. Overall, I believe my team would say I am supportive, honest, and always try to find better ways of satisfying our Guests, while taking as good care of my team as possible. When you are creating food for an event, what do you hope the event attendees will say about the food? What do you want them to enjoy and/or remember? I hope the attendees enjoy the offerings and the food complements their programming or theme. It is our goal to exceed expectations with the menu content as well as the execution. Disney’s catering division has resources only available at Disney, which allows us to deliver the Disney difference. From where do you draw culinary inspiration? I draw inspiration from a wide variety of experience in both hotel catering operations, as well as fine dining restaurants, along with reading current publications and dining research as often as possible. It is also a key component of inspiration to tap the cultural diversity of my team and their experience to never stop learning and absorbing ideas and methods that will push the envelope. What do you think are some popular trends in catering today? Guests today are looking for organizations that support sustainable and local foods as much as possible. Although formal dinners still and always will have their place in catering, well-executed grab-and-go items and comfort foods are in high demand, using creative presentation solutions for plated events. Interactive food stations that connect the Guests to the Chefs are increasingly popular and should be set up to mirror an a la carte kitchen line, using sharp, professional-looking equipment that is dedicated to dining room action stations for show appeal. The aromas from a BBQ grill, for outdoor events, immediately stimulate the senses before the Guests taste anything. Additionally, Guests today are highly educated, so attending in detail to any food allergy and special meal requests is a focus of most clients. Among all the events you’ve catered, tell us about your favorite one. Most recently, we hosted a culinary association national conference and culinary competitions. We were uniquely challenged by these events, 800 Chefs and industry professionals all under one roof, for 5 days, along with our exhibit hall converted into a competition demo kitchen. The menus were all customized to coordinate with the sponsor food provided for each event. This may sound very ordinary to most catering operations, but when you add to that the invasion of your kitchen by numerous competing Chefs and their needs for prep space and products, it becomes very special. Our culinary leadership and Cast executed at a very high level with military precision. 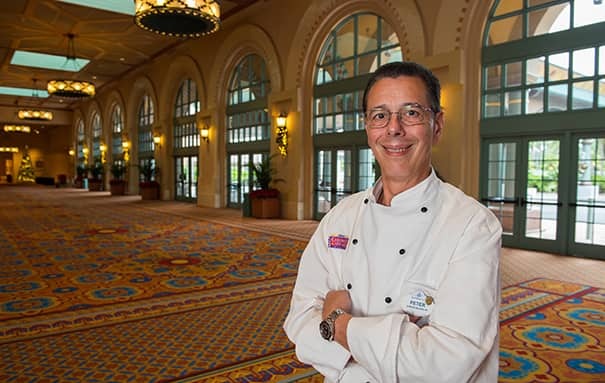 One comment from the association’s senior leadership was, “We asked for a home run, and we hit a grand slam.” Kudos to Disney’s Coronado Springs Resort’s culinary leaders and Cast. What’s the best part about being a Chef de Cuisine for Disney? The camaraderie and partnership with all six areas of catering providing support to each other as needed with leadership, Cast deployments, and equipment loans are the best part of being a Chef at Disney. No one area is ever completely on their own, as support is an email or call away. Tell us – How does Chef Peter’s story inspire you? Let us know on Facebook, Twitter, or LinkedIn using hashtag #DisneyMeetingsBlog. We're eager to help you create the perfect meeting or private event for any size group, theme and objective. To speak with a Disney Meetings representative about our pricing and options available at our Disney Parks & Resorts destinations in Florida, California, Hawaii, or at our international destinations, please Contact Us or Submit a Request for Proposal. Or, Sign Up to stay in touch and continue learning more about Disney meetings and events.